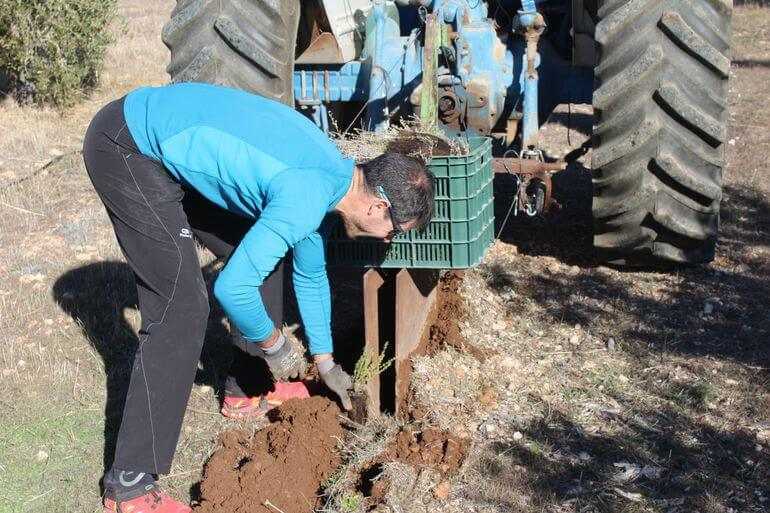 Newly planted lavender at Alvelal Association member Fran Martínez Rayas' farm in his olive grove in Gor, Granada. The honey olive grove, designed by Madrid-based landscaper Javier Domínguez, is an agro-landscape concept consisting of a polyculture system that combines olive trees and aromatic bushes. It has been launched on the EU platform, Climate Innovation Window, which embeds the EU Horizon2020 project BRIGAID, aimed at effectively bridging the gap between innovators, investors and end-users in resilience to floods, droughts and extreme weather. In the Community of Madrid, plans are already under way to introduce honey olive groves, both to boost revenues and protect the community’s ecology. Domínguez’s grove plan provides for the strategic positioning of herbs, such as lavender and rosemary, grouped into blocks, between the rows of olive trees, according to a pattern which brings several benefits to the orchard. “The aromatic hedgerows have the capacity to act on water effects, serving as a physical barrier for collecting rain and runoff water, thus helping the olive grove to prevent flooding and soil erosion,” the landscaper said. “Situated in parallel to the dimension lines, herbs mitigate water effects that trees can’t, while in the case of hill slopes, aromatic bushes could be strategically located to act as traditional terraces,” he added. The great advantage of aromatic herbs is that they are melliferous, producing honey. This can be used as an additional revenue stream in olive groves as well as increase biodiversity. Olive trees, whose flowers are small and unscented like other vegetable species, are not honey plants and do not attract pollinating insects. They are mostly wind-pollinated (or anemophilous). Aromatic herbs, such as lavender and rosemary, on the other hand, attract bees and other pollinators. These melliferous plants provide the basis for an extra beekeeping activity. “Provision and maintenance of ecosystem services, such as biodiversity and pollination, have key importance in the sustainable adaptation to climate challenges, while the production of a food like honey paired with the extra virgin olive oil can be seen as a further benefit for the population, especially in depressed regions,” Domínguez added, showing the ethical side of his project. When it comes to the most suitable type of farming for this pattern, although there are no incompatibilities, chemical-free and organic approaches are to be preferred, keeping the practice as a low environmental impact cultivation method. The aesthetics should not be underestimated either. “Beauty attracts people, making the [day-to-day lives] of locals more enjoyable, while captivating tourists and travelers,” he added. Domínguez explained that first, in 2015, he designed a ‘dehesa de miel,’ a honey grazing land, and then he devised the honey olive grove and vineyard. “I thought that the wine world would answer quickly, and then the olive oil sector was the most interested and the first to implement the project, indicating its responsiveness and flair for sustainable innovations,” he concluded.